On November 21, 2015 Amaretto wanted to celebrate Thanksgiving with some 2015 Thanksgiving Limited Edition Horses. The 2015 Thanksgiving Limited Edition Horses do have the ability to pass the eyes as well as hidden surprises. These 2015 Thanksgiving Limited Edition Horses have a chance at getting the eyes as well as hidden surprises from any breeding. You can read all about them here:http://wiki.amarettobreedables.com/index.php?title=2015_Limited_Edition_Thanksgiving The Surprises was the Overo Amber!!! 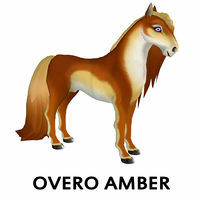 Overo Amber Coat DOES have the ability to pass! This page was last edited on 7 December 2015, at 20:25.